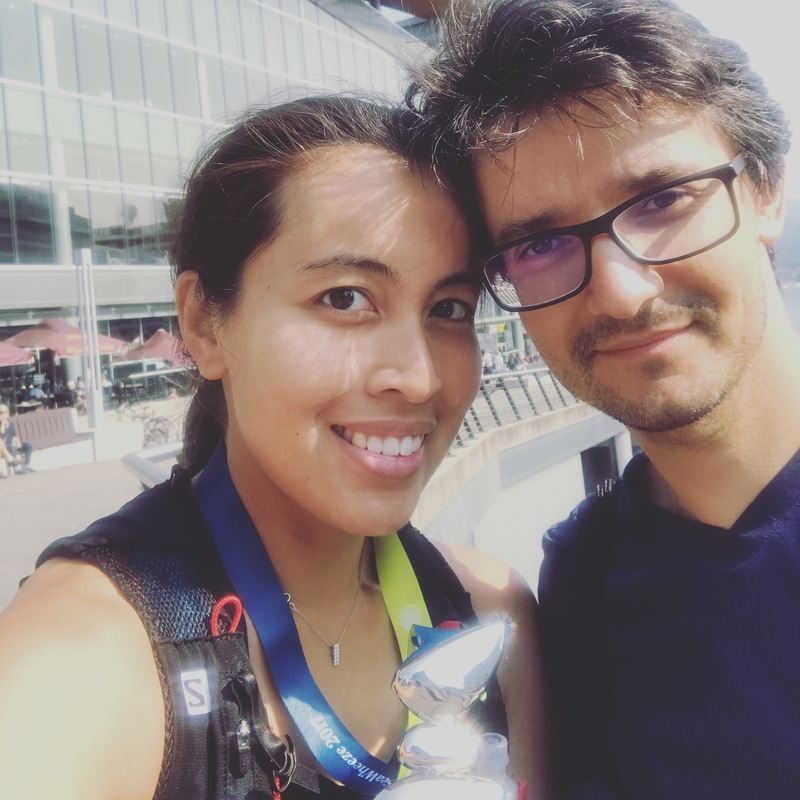 The Seawheeze Half Marathon weekend came and went so quickly. It seemed like yesterday, that I arrived to work 10 minutes early, cell phone and web browser locked and loaded, ready to refresh. I was a lucky person to get an entry problem-free. I knew others had problems at the payment page. It was a whole weekend of events, one thing I regretted doing was not getting the Friday off so I can relax and enjoy the festivities. 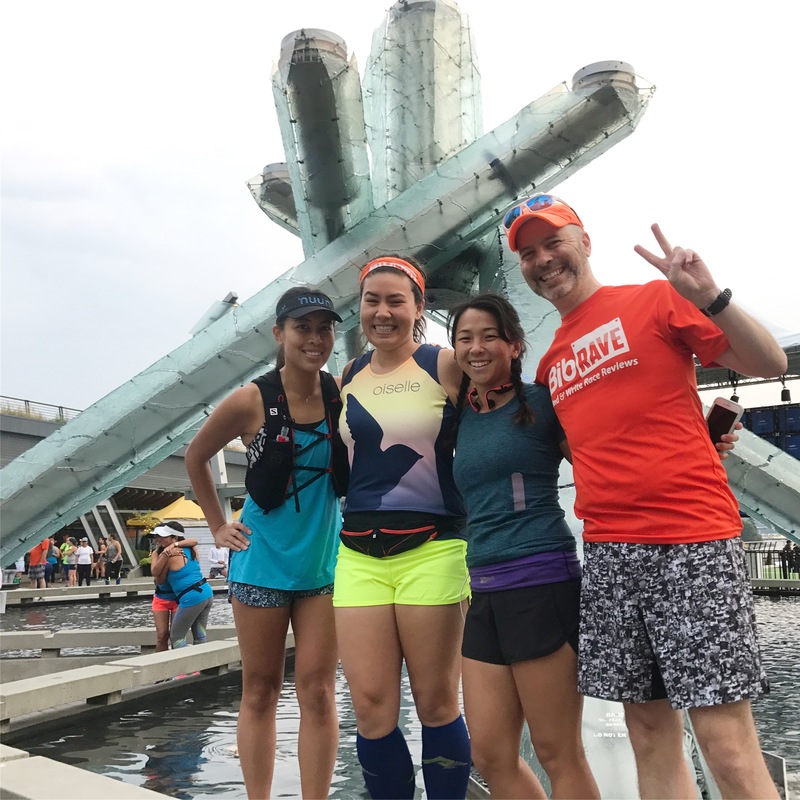 This was the unofficial start of my Seawheeze Half Marathon weekend… a social run with fellow BibRave ambassador Amanda. 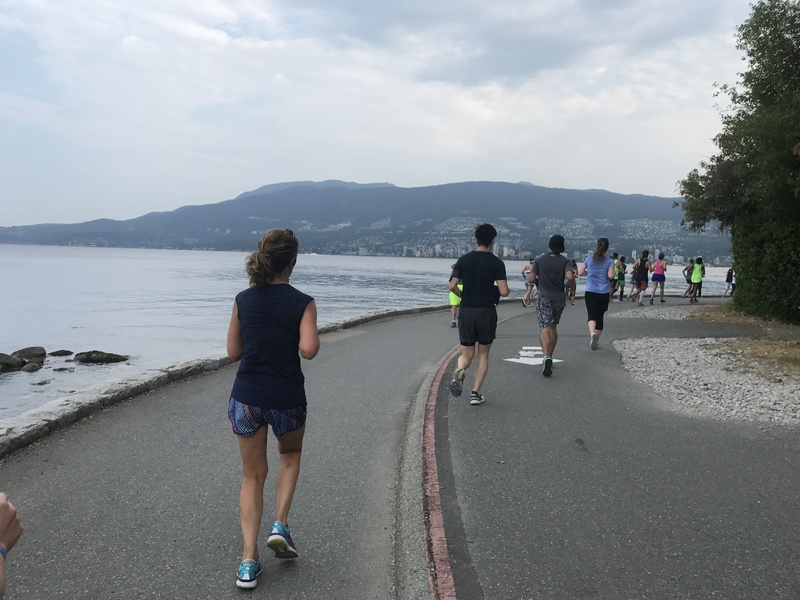 We joined the Forerunners club on a 9 km run to the anchor at Spanish Banks and back to the shop. It was still very smoky, humid and hot that evening. Things weren’t looking good for half marathon weekend so PR-ing the race was far from our minds. It was all about surviving the smoke. Despite the rough conditions and not being able to see the mountains, we enjoyed our beach run and even tried on some Mizuno Wave Sky shoes. 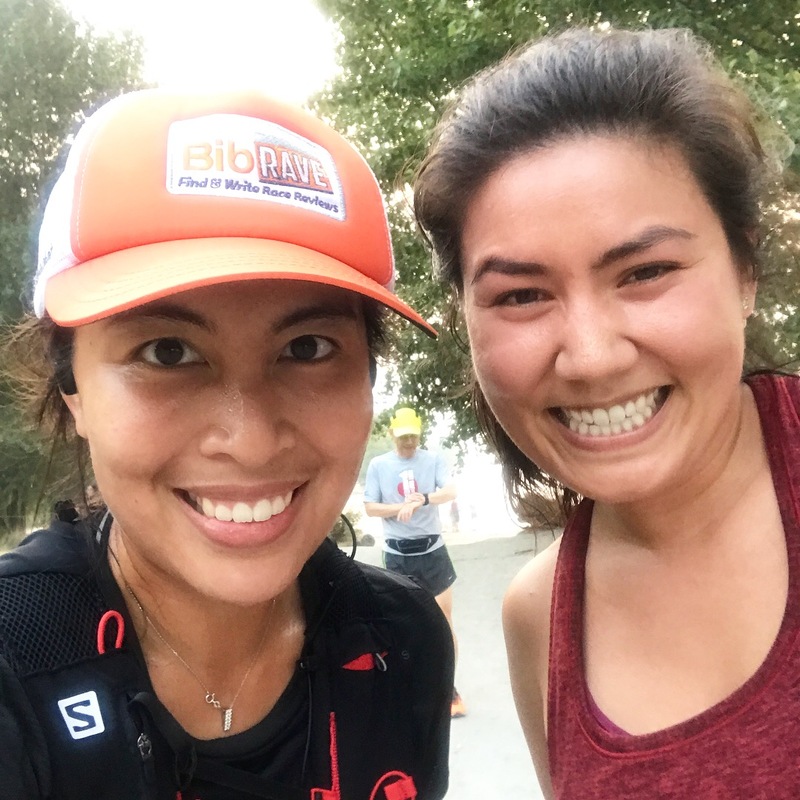 Check out the Forerunners club on Strava to find out when the next Sunset Social Run is. 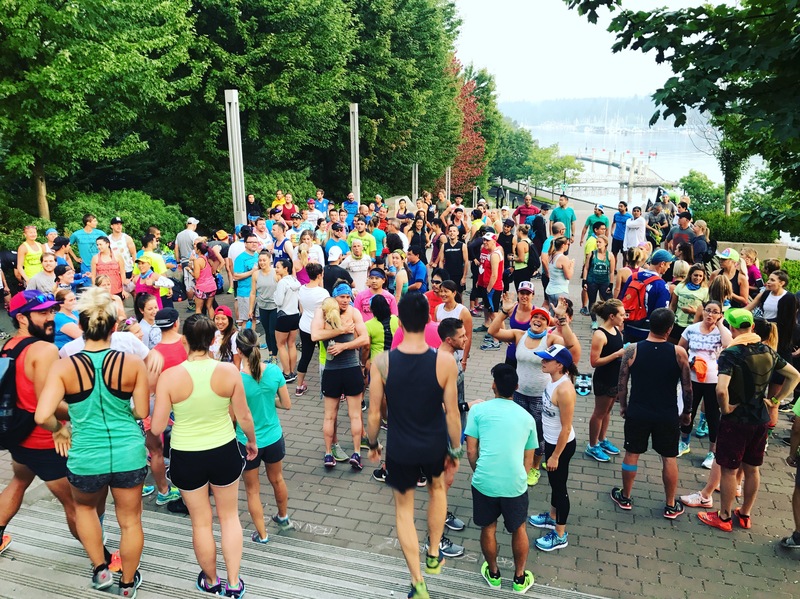 The next morning, I woke up bright and early to join 200+ happy people the 3rd annual November Project Seawheeze Pop-up workout. 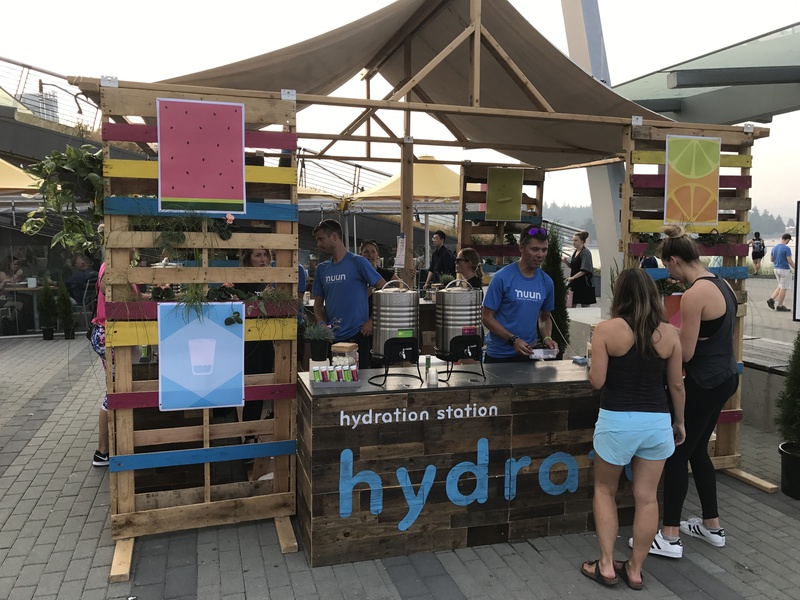 The Seawheeze Half Marathon always draws November Project tribe members from all over the US and Canada so having a pop-up is a no-brainer. It was fun, we ran by everyone in the Showcase store lineup. We bounced, we did plank jacks, lunges, and tricep dips. Last but not least, burpees to the song Roxanne and a family photo. I haven’t been to NP in a long time, I forgot how awesome the energy is. 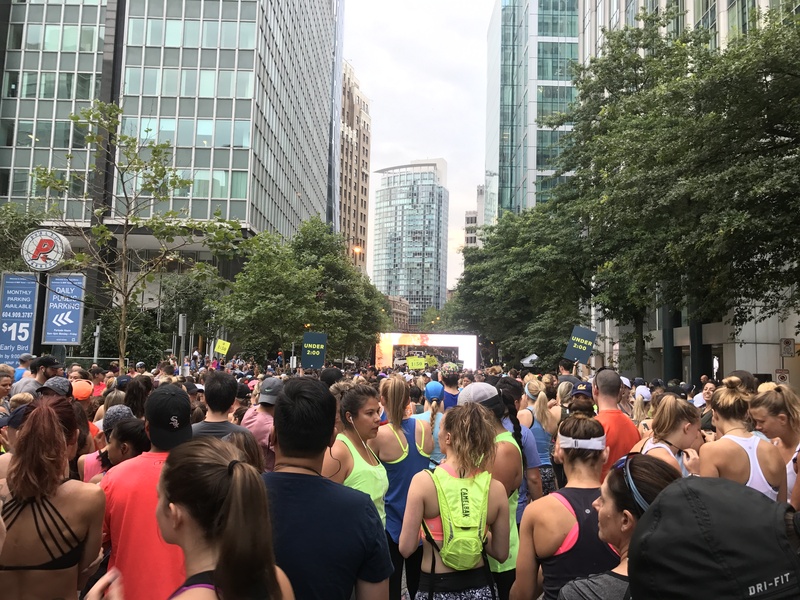 I had no inclination to get up before sunrise to join the masses to line up for the Seawheeze Showcase Store. Besides, people have been lining up since 2 days before the sale. There was no way I was going to get in right away anyway. I went on my lunch break instead. I ran into some NP friends and we got in the package pickup line. There was still quite a bit of people but the line moved pretty quickly. They’re very organized and had so many people ushering us in and directing us where to go. I got my entry wristband, drawstring gear bag (worth $68), water bottle, timing chip, a tube of Nuun, and sunglasses. You can’t get into the Showcase Store from the Package Pickup area. They had it separated so you must fall in line again. Thankfully, there was no line and we got in quickly. There was still merchandise but obviously the best stuff is gone. I ended up buying an Invigorate Bra in a blue and black pattern, similar to this. I’m ok with my one item because this year, runners were invited to an exclusive online store with limited merchandise. I was able to buy Speed shorts there. I heard that the link was leaked and others weren’t able to buy things for themselves. There has to be a way for legit runners to log in and purchase and not the general public. I ran into fellow BibRave Pro Mai at the store too. 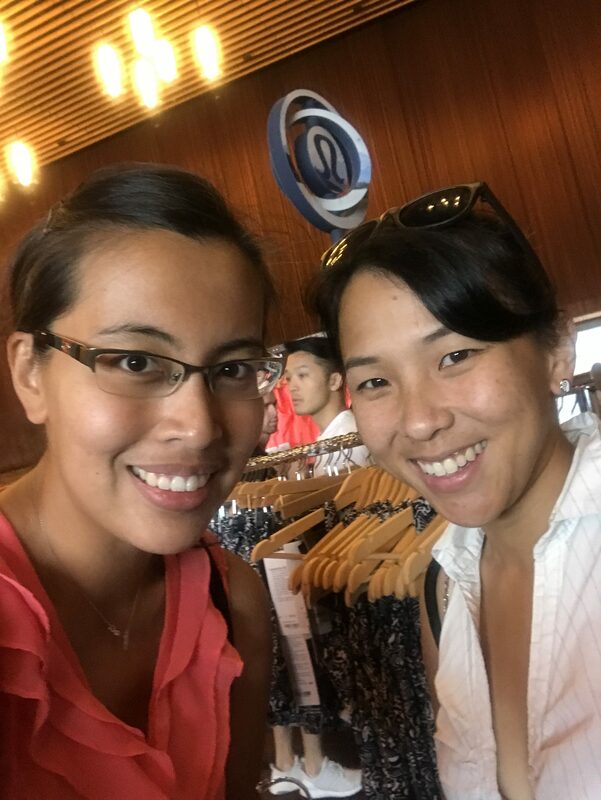 Great to finally meet in person! 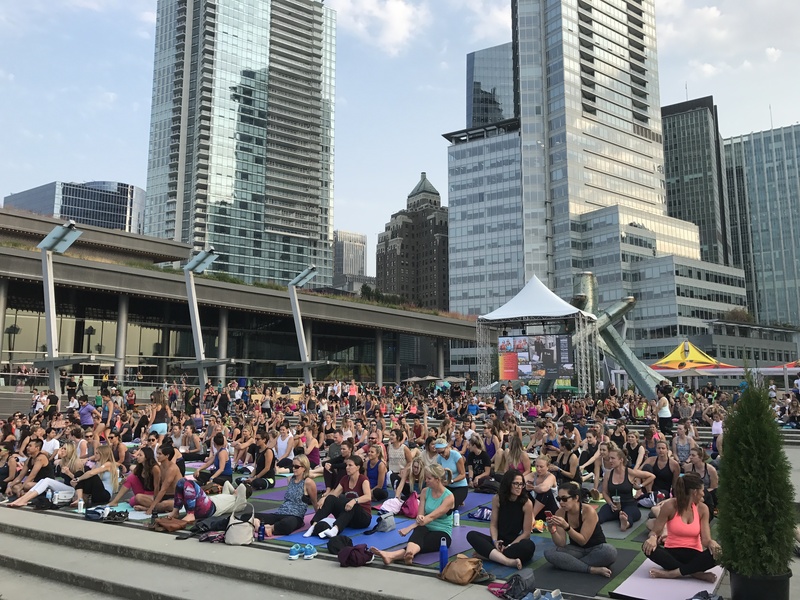 Yoga sessions were held at Jack Poole Plaza and the sponsors were out there giving free swag. Seems like services from last year like hair braiding and men’s haircuts weren’t available this year. However, I heard that people in the lineup were given pizza and hair braiding. First things first, I met with my fellow BibRave Pros (Amanda, Mai, and Bradley) at the cauldron for a photo. Afterwards, Amanda, Bradley and I made our way to our corral. The vibe was electric and I loved the new video arch. I had no expectations going into this race because I wasn’t sure how the air quality was going to be. Thankfully it was mostly overcast with a breeze; however, it did get warmer later on. The smoke also cleared so runners were able to enjoy mountain views along the seawall. Most importantly, I was able to breathe clean air again! Check out my race on Strava here! I hadn’t really tapered but I tried my best anyway. Despite not training specifically for this race, I did well. I ran a 2:17:44, slightly faster than last year’s performance. There were only two walk breaks: somewhere between English Bay and Second Beach and the hill at Lumberman’s Arch. 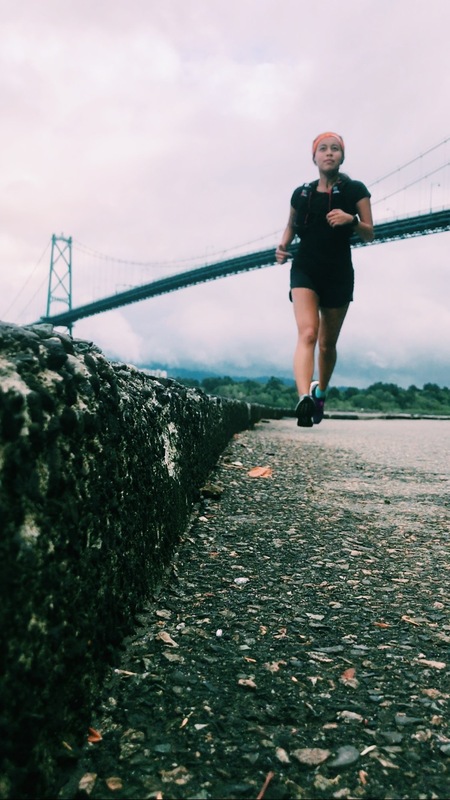 I felt strong, inspired, and maintained my pace. I also feel like my stamina in warmer temperatures is improving. As I sprinted to the finish, I heard someone yelling at me to sprint and go faster. It was Cuski motivating me from the crowd. I was too focused on running that I wasn’t exactly sure if it was him. Turns out it was 😛 I really appreciate his ongoing support and was so glad he was there at the finish. Spin bikes on the viaduct – Ride Cycle Club had a huge showing on the viaduct this time. Lots of bikes and balloons, it was a party! Mermaids and Drag Queens – back for another year, always a hit with runners. Saw lots taking selfies with them. Cops and firefighters at Second Beach – their energy and signs are always great, but even better this year, they were spraying us with the fire hose. Yes! Sand sculptures – at the top of Lumberman’s Arch, on the way out of Stanley Park, there was a series of sea creature sand sculptures with funny signs. I wish I got photos of them. They’re so beautiful! Finish line – the last few hundred meters were lined with spectators cheering so the energy was awesome. I managed to go for a last effort sprint and finished strong. Check out Lululemon’s highlight video to see what I was talking about and more! I love the medal! It’s a cairn, a stack of stones. Apparently if you take the ribbon off, you can also use it as a bottle opener. Dual-purpose medal! 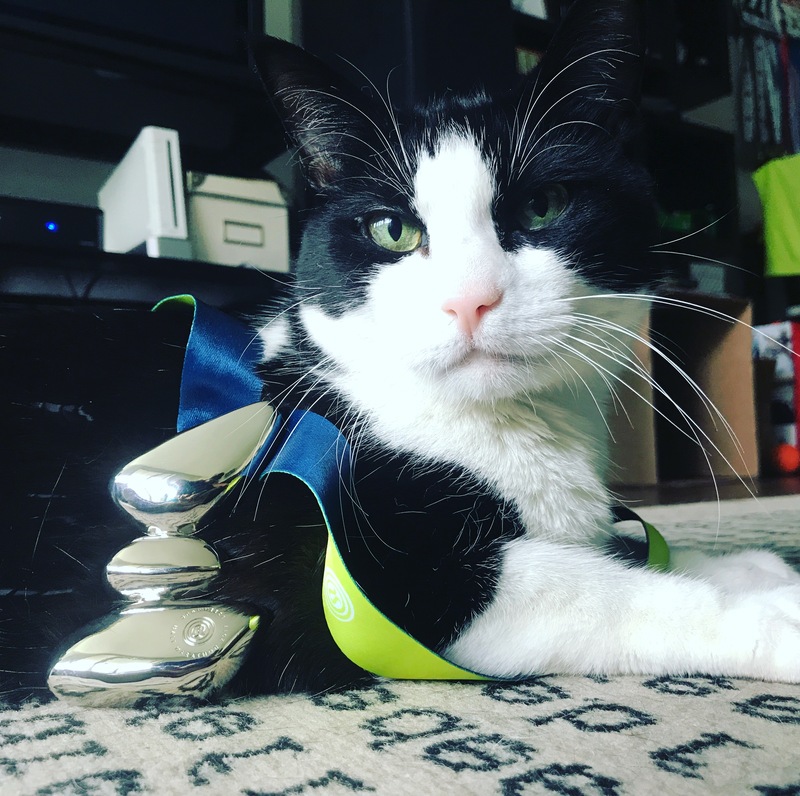 Here’s my cat modelling it for you. As soon as we got our medals, we just followed the path and received water, a refreshing moist face towel, a Nuun tablet, and some Vega bars. I was looking forward to the hat but… NOPE, no hat this year! The reasoning is because the big ticket item this year is the gear bag (maybe that’s why they included the price tag). It’s not a bad bag, I’ve actually been using it. I just missed the hat. The breakfast lineup was seamless this time around. Last year was a mess and this time, you literally just walked to a table and grabbed a box. I liked the box better this year too. It had banana bread, fruit, yogurt, and something else I can’t remember. I thought it was way better than a breakfast sandwich, the banana bread was delicious. I was wondering where the Saje giveaway was. Normally it was given on the way to breakfast but this year you had to visit their booth. It was a bigger package this year with 2 oils and a muscle calming lotion. I heard that the booth ran out of these packages and some runners didn’t get one. That’s too bad if that’s true. We left as soon as I finished eating. 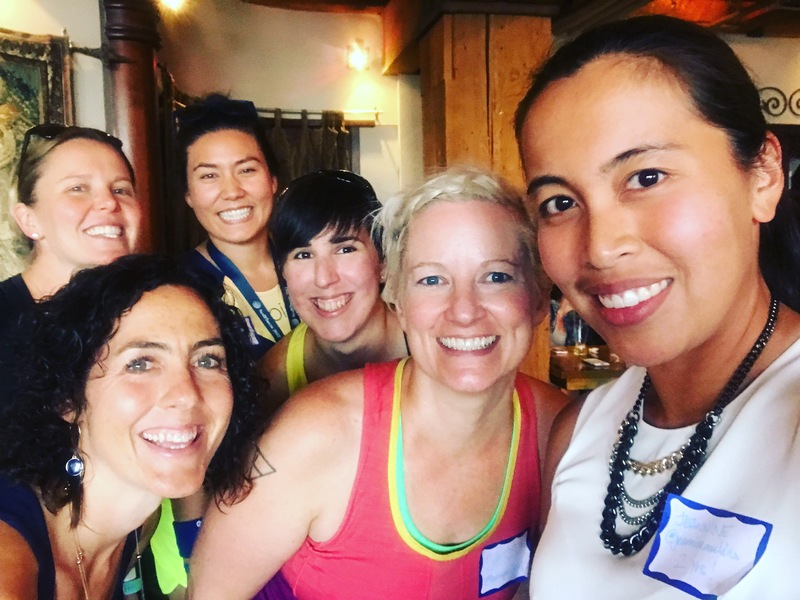 Nuun Hydration organized a Nuun at Noon event for ambassadors at Steamworks after the race. I went and got spoiled with some delicious appetizers and beer. I also caught up with some runner friends and met new ones. I’m already inspired by these awesome ladies after just speaking to them for an hour. Thanks Nuun for having us! Unfortunately, this year I opted not to go to the Sunset Festival. I was still on a marathon training schedule after all. I needed to run 42 km that weekend (a 13k and a 29k). 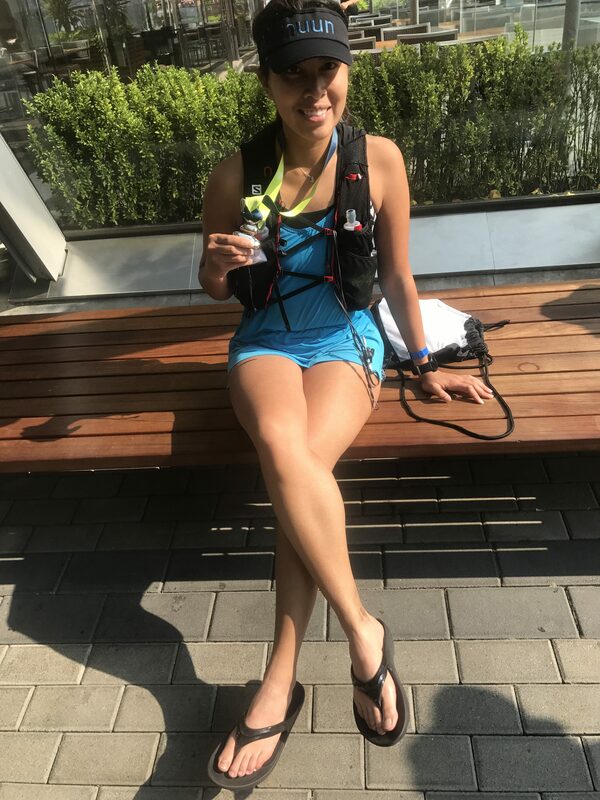 Thanks to the Seawheeze, I had to run the difference on Sunday, which is essentially another half marathon. I took it easy on Saturday night and slept early. The next morning, it took me a while to get up and out the door. I was running better than I thought and maintained a consistent pace for about 11 km until I hit a wall. Mind you, I didn’t fuel properly that morning. I should’ve eaten more but oh well. The last half was a bit of a struggle but I managed to complete it. My half marathon double header was over. 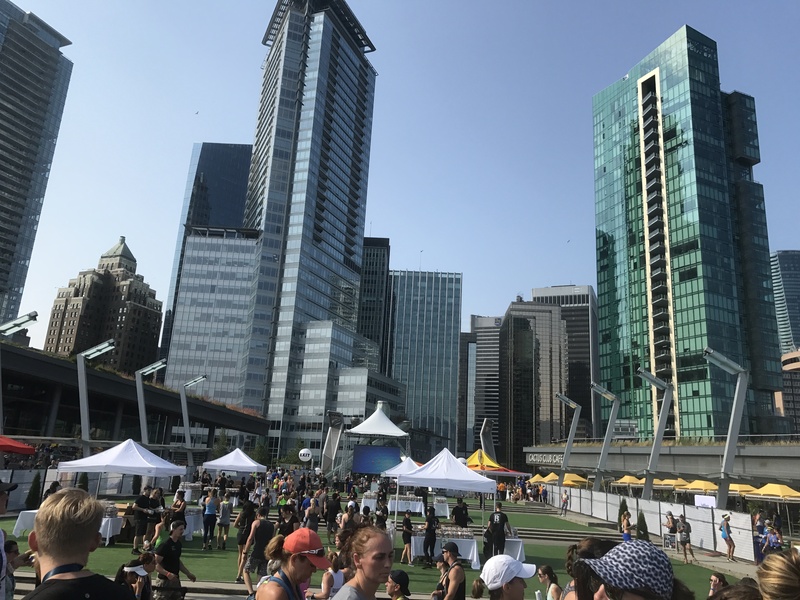 Would I run Seawheeze again? Yes, I think I’ll sign up again next year. It’s just so expensive that if I don’t get in, it won’t be the end of the world. What’s new this year was transfers! If they bring it back next year, it will be amazing. It gives people a chance to run it legitimately if other runners have to withdraw. It’s a great destination race because there are so many activities for you to take part in. The Lululemon Test Truck even did a little run club tour and if you paid attention to social media, you could join in on some free shakeout runs. There was also a lot of yoga leading up to and including Seawheeze weekend. 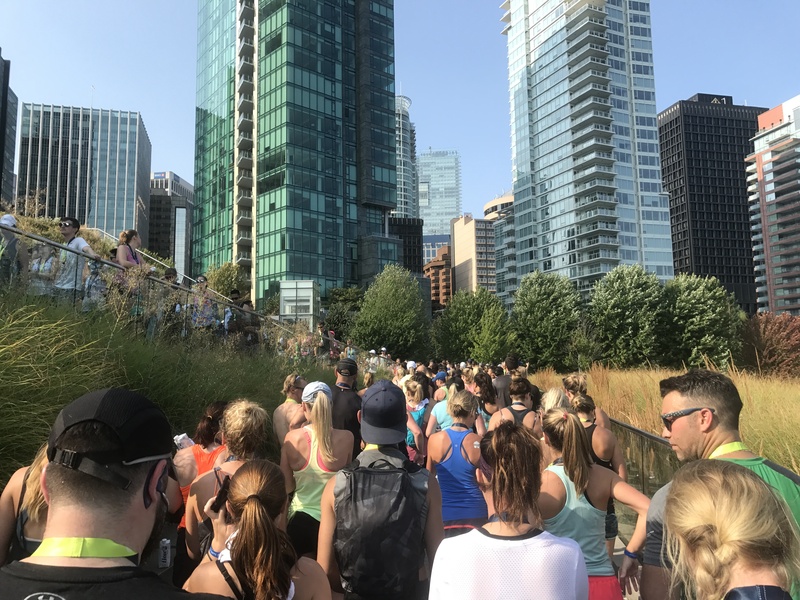 Lululemon makes a huge splash with Seawheeze, which is why it draws so many people from all over the world. Hope to run into you on the seawall next year! 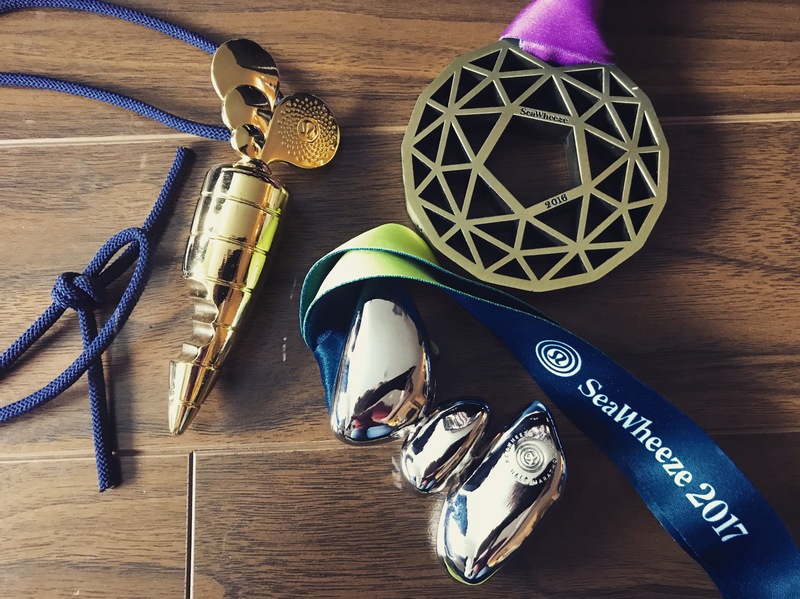 Did you run the Seawheeze? What did you think? Leave a comment below!